Home / Archive Category: "Software / "
A major security vulnerability has been discovered in the GNU Bash (Bourne Again Shell) for the Linux operating system. System administrators running Red Hat Enterprise , Fedora, CentOS, Ubuntu, and Debian distributions will want to update to the latest release of the Bash package. This vulnerability affects Bash versions 1.14 – 4.3 which is even included in the 10.9.4 releases of the Apple OS X operating system also known as Mavericks. Even if you are running another distribution of Linux such as Mint or Zorin this does not exclude you from being affected by this vulnerability. Forks of Red Hat and Debian based distributions will very likely be running Bash and need to be patched. If you listen to our news broadcasts here, you are very likely to hear stories about patent trolls and “copywrong” as Lumpy uses to refer to the current state of intellectual property law. It has reached the ridiculous point where trolls are laying claims to broad matters such as playlists and podcasting. This is about as logical as patenting the alphabet. The video below, explains how old law and new tech combined to create software patent trolls. Having been a member of Steam since mid 2009 I have had some time to build up a decent game collection. With right around 300 paid games linked to my Steam account I have found myself anxious for the Steam Box. When I see a good deal on a particular game, whether I need it or not, I buy it. Some, to support the developers, and some, just for the sake of owning it. With a collection of just under 300 games valued around $3,554.21, I would be considered by some a game hoarder. This past month I ran into an issue. I attempted to purchase Terraria on sale for $2.49. I gladly entered my credit card information and submitted my purchase. Four times I received a rejection from Steam. They claimed I was putting the wrong 3 digits from the back of my card. I verified this and attempted again. Still my card is not allowing the purchase. I decide to then contact my bank to see if they are having an issue. They state that the charge from Steam is being marked as fraud, but, one charge did successfully go through. My bank recommended that I contact Steam and verify that this transaction was successful. I looked around Steam’s website searching for some sort of contact us button. Any way to find some live support. I was routed to a simple “Enter your question here” box. I sent a simple and direct message stating that the bank put the funds on hold, but, one of the charges had gone through. I mentioned I did not see the credit in the Steam system granting me this game. Being business hours I hoped for a decent response time. I watched in horror as the game went back the normal price while I wait for a simple answer from anyone at Steam Support. About 24 hours later I received a message stating that my card was declined because the security code did not match. I get a cut and paste response to my issue talking about CVV2 codes and 10 days blah blah blah… I verified with my bank that I was running my card correctly. I replied to the messaging informing them the bank found their transactions to be fraud and that was stopping my transaction. I only asked that I receive the special price I attempted the 5 or 6 previous attempts at. Welcome to another episode of Through Gamer Goggles News. This week we will be focusing more on video games than normal but it also converges with the set of Warhammer 40K. Listen in as we discuss the latest gaming news. We opened this show with You’ve Got Hogwarts by Robert Lund who is a member of The Funny Music Project or The FuMP for short. The Warhammer 40K franchise has already reached thousands of players all over the world. This can be proven by looking at various Warhammer 40K websites and blogs. The fan base is still growing because Warhammer 40K’s story is not yet concluded. This major gaming niche never missed the eyes of Chatwing’s developers. This is why they created a website chat tool that can help Warhammer 40K fans connect with each other and share their gaming experiences. Blood moon will add a gripping layer of gothic horror to the game. In addition to new challenges Blood Moon will bring two new mechanics: Time alternates between “day” and “night”, and a bloodthirsty Werewolf prowls the land. A new time card id placed at the center of the board. Whenever a player draws one or more Event cards he/she flips the card to mark the passage of time. Night and Day have various gameplay effects. Like being turned into a werewolf. Werewolves have special rules. To close we went with a zombie themed set. This week we will discuss things net, tech and kewl including “earthscrapers”, a printer hack, a hybrid hard drive, a Grooveshark whistleblower, hackers hit the UN and Global Chokepoint. We wish to warn the listener in advance that there is some material in this podcast that would be considered not safe for work or children. Using CCleaner to speed up your Microsoft Windows PC. A great application that many people don’t know about is CCleaner. This application will clean out your temporary files, optimize your system registry, and increase your privacy with a number of products you use. Many people don’t realize it, but, you are accumulating files on your computer with typical daily use that don’t need to be there. 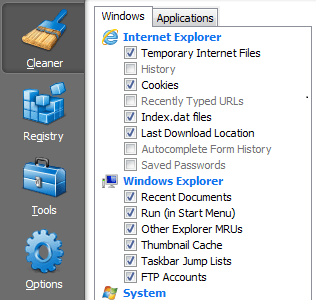 Internet browser temporary files and Windows system files take up space on your computer and should be cleared up from time to time. I encourage everyone to head over to www.FileHippo.com and download CCleaner. This is the best application currently out there to solve this problem. 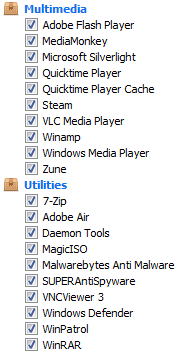 After installing the program you will see a bunch of check boxes for different things the program will clean up. Personally I choose to disable clearing my browser history and recently typed URLs under the browsers that I use regularly. 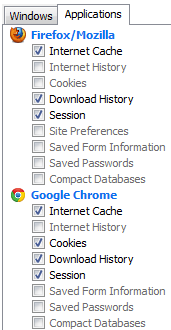 If you don’t care about your browser remembering links you typed previously feel free to leave those options checked. I do however recommend checking to clear all Temporary Internet Files. People can get gigabytes of information stored there over a period of time. The Windows Explorer section doesn’t do anything that drastic so I tend to keep them all checked. Under system, however, there are some important boxes to check. I have in the past run into people who use their Recycle Bin as a storage area. They were shocked when I emptied their Recycle Bin and said “I had important files in there”… If this is your method of file backup I ask that you take your computer to your local charity and donate it for your own protection and for the benefit of someone less fortunate. The Recycle Bin is a trash bin. If you keep your important documents in the trash can out on the curb of your house and are surprised that the truck drove up and took them away this is the same situation. The next option is Temporary Files. These are files that your operating system creates and are usually not something you will need to access later. Clear out Memory Dumps also. Depending on your settings these can be very large at times. 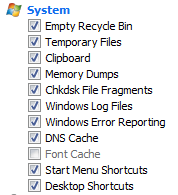 I check all but Font Cache in this section and have never had any issues. The Desktop and Start Menu Shortcuts option made me nervous at first, but, it seems to clear out icons that are no longer valid. The advanced section has some options that won’t make a huge difference. You will get a notification on some that you will need to restart certain services if you select those options. Choose what seems beneficial to you in this section. I would not recommend selecting Wipe Free Space unless you want to ensure that someone could not “undelete” files from your computer. Under Applications the top will show settings for each of your browsers. Internet Cache is fairly safe to remove. Internet History is depending on your personal preference. I would be cautious of whether to remove Cookies or not. Cookies are what remember your preferences for individual sites throughout the Internet. If you check the Saved Form Information box this will make your browsers forget information like City, State, and Address information that might be remembered from a previous form you may have filled out previously. At the bottom you will see a Compact Databases choice. Your database stores your bookmarks, history, and other data. CCleaner can defragment this database to help save some space. The Applications, Internet, Multimedia, Utilities, and Windows sections are based upon the software installed on your computer. There are not individual settings for each of these programs, but, it will not do any drastic changes to your application. 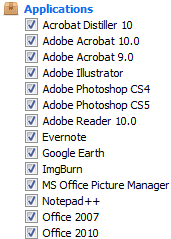 I leave all of these checked so that files are not built up over time from these applications. It is fairly safe for you to choose all of these boxes. At the bottom of the screen you have an Analyze option and a Run Cleaner option. If you Analyze it will only tell you what could be removed and how much space it would free up. This is generally a good idea when it is your first time running the application. This will give you an idea of what you are getting yourself into. If you are content with what it is telling you go ahead and press the Run Cleaner button. You will, however, need to close any browsers that you have open before pressing this button. If you do not close your browser it will not be able to clean out the temporary files in some instances. Next lets look at the Registry tab. The Windows Registry is a set of files that contain all of the settings for your Windows operating system. It will remember settings such as what program do you open a .doc file with or what programs will start-up when you logon to your computer. As programs are added, updated, or removed from your computer your registry will build up items that are broken or missing. The Registry cleaner will remove these items allowing your registry to run more quickly. If you are an advanced user you may see entries that you want to be there and don’t want to be detected in future scans of this application. You can right-click on that entry and add it to the Exclude List. Next time you select Scan for Issues it will not show that particular item in the results. The CCleaner Registry cleaner is not an aggressive registry cleaner. I have never had a case where it has caused problems with any computes that I have run it on so you should be fairly safe when using it. Select Fix selected issues and then choose Fix All Selected Issues. You may want to run this application once a week or once a month at a minimum. Many users will see some noticeable performance improvements from doing these steps. If you have any questions feel free to leave a comment and I will try to respond. There seems to be no shortage on iPhone apps. Everything form a case mod with and app to turn the phone into a bottle opener to whatever is limited only by your imagination. Recently the iPhone is in the news again. First, there is a controversial iPhone app that allows you to buy your friend a beer. When this story was reported on my local six o’clock news, the reporters immediately pounced on the fact that it might allow minors to buy alcohol. It is an app that allows you to send your friend a coupon to buy a him or her a beer. One thing my local news pointed out was that, in order to install the app from beer2buds.com, the installer must agree that he or she is 17 years or older. Is there any state with a 17 year old drinking age? First Time ever at http://www.custompc48809.com We are doing a GIVEAWAY!!!! Sometime In May we will hold this event and the event will take a few hours. The lucky winner will be announced over VIA email, Twitter, FaceBook and Live Video Stream. Rules and Information will be located on the site, also we are looking for everyone’s Idea’s for the event. What should we do??? If you have a idea or comment, go to http://www.custompc48809.com/#/contact/4548980785 and submit your idea. The Prize will be some sort of Computer Device or Electronic… CustomPC48809.com is a Computer Service and Hardware Site. Might as well make it a good Prize. Let your Friends know.